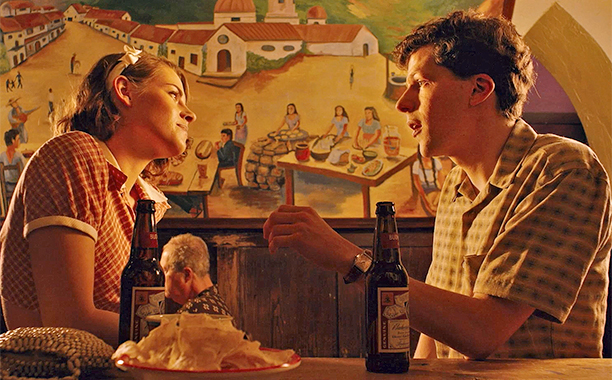 After watching Woody Allen’s new film, I became obsessed with the title, Café Society (2016). At first, it was the opening word that bothered me. There’s nothing even close to a café in the film, at least in the sense that you’d imagine, a little French bistro where people sit around talking about Kierkegaard. The film concerns Bobby Dorfman (Jesse Eisenberg), an ambitious young man who leaves his Jewish family in the Bronx to go to Hollywood to become a writer. In other words, Bobby is yet another Woody Allen doppelganger; Eisenberg joins a very long list of actors asked to adopt Allen’s nebbish mannerisms (Kenneth Branagh, Will Ferrell, and Larry David demonstrating the wide range of those who have taken on the role, a kind of Batman for the intellectual set). In Los Angeles, Bobby’s heart is broken by Vonnie (Kristen Stewart), the love of his life who turns out to be sleeping with his horrible uncle, a talent agent, Phil (Steve Carell). Bobby skulks back to New York, where his family arranges for him to run a nightclub with his ne’er-do-well older brother, Ben (Corey Stoll), a murderous gangster. Set in the 1930s, the business becomes fashionable for high society, but by no means is this a café; it is a post-Prohibition speakeasy. But it is the title’s second word, society, which turns out to unlock the allegorical key to the film. There’s precious little evidence of civilization on display. Both Bobby and Vonnie begin the film with ironic attitudes toward Hollywood, loving to go to the movies, but hating the crass filmmakers around them. They spend their time in cozy Mexican restaurants making fun of the shallow people of Los Angeles. However, when Vonnie is forced to choose between Bobby and his unctuous uncle, she chooses the latter, and becomes everything that she and Bobby formerly loathed. When she meets Bobby in the nightclub, years after their love affair, she is the worst name dropper, gushing about a party she attended with Errol Flynn and Irene Dunne. She has become the vacuous one. For his part, Bobby is no better: he wanders the club schmoozing with the rich and famous, living off of the largesse of his gangster brother’s ill-gotten gains. What’s surprising about Café Society is that it’s not a nostalgic film, like Broadway Danny Rose (1984) or Radio Days (1987), where Allen reflected back favorably upon the way things used to be. Instead, this new film is a razor sharp engagement with the present. What if the absence of society in the film points not to the obvious cliché, the crass commercialism of the Hollywood industry, but to the absence of civility in American politics? Bobby is caught between the barbaric, his gangster brother, Ben, let’s call him Donald Trump; and Vonnie, a loving but misguided opportunist, let’s call her Hillary Clinton. Vonnie marries Phil, knowing full well that he is a serial philanderer, resulting in her close proximity to the rich and powerful. In the midst of the story about Errol Flynn, Vonnie tells Bobby about her wonderful experience at the house of Robert Montgomery. Given that Montgomery was one of the most notorious right-wingers in classical Hollywood, her facility with the deplorable strikes one as fully resonant with Bernie Sanders’ critique of Hillary Clinton’s facility with the power brokers of Wall Street. The film’s hero becomes its other Woody Allen stand-in, Leonard (Stephen Kunken), Bobby’s brother-in-law. When Bobby’s sister, Evelyn (Sari Lennick) complains about a bullying neighbor, her brother Ben takes matters into his own hands, murdering the man and burying his body in cement. After Ben is arrested, tried, and executed for murder, Evelyn sticks up for her brother, hysterically crying that someone needed to stand up to the bully, given that her husband’s impotent talking did nothing to solve their problem. Leonard, the communist intellectual, is the only character in the film who stands up for civilization, quoting Socrates and defending the merits of conversation over violence. Like Crimes and Misdemeanors (1989), Café Society ends with its two main characters in a state of moral stasis. Dueling close-ups on Bobby’s and Vonnie’s faces, with the camera swirling around them, indicate that their opportunism in life has denied them happiness. Yet given the anti-social forces that drove Ben’s violence, we are left with no choice but to identify with them. They are imperfect human beings, just like us. One of the films that Bobby and Vonnie see together during their romance is 1936’s Libeled Lady. Given the impossibility of imagining a society run by Donald Trump’s love of Russian gangsters, we are left with sorting through the libelous lies the right has told us about Hillary Clinton, not denying the moral flaws associated with her embrace of what Allen calls “café society,” but nonetheless seeing in her the only hope for the continuation of civilization.